I’m a big believer in keeping up-to-date on all of the inner workings of Google’s Adwords program. Unfortunately, the program has grown so complex that it is nearly impossible to know all of the top Adwords tips and tricks that can help you efficiently optimize your account. In this post I have started compiling some of the most useful Adwords Tips that I use on a routine basis for my campaigns. As I discover more tips, I plan on adding them here. If you know of any useful tips that I don’t mention, please be sure to let me know in the comments. Negative keywords are keywords that prevent your PPC ad from being shown for a certain word or phrase. Many Adwords users, both new and experienced, underestimate the importance of negative keywords. The appropriate use of negative keywords will prevent “bad” traffic from reaching your site, lower your overall PPC spend, and improve your Adwords Quality Score. It’s extremely easy to add negative keywords, simply select the campaign or ad group that you want to add negative keywords for and scroll down to the bottom to the +Negative keywords section. 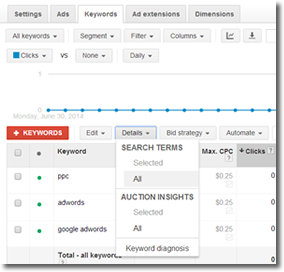 Expand the section by clicking the “+” and add your negative keywords at the Campaign level or Ad group level. The key to using negative keywords is finding and selecting the best ones. One of the best ways to find good candidates is the Search Terms report. 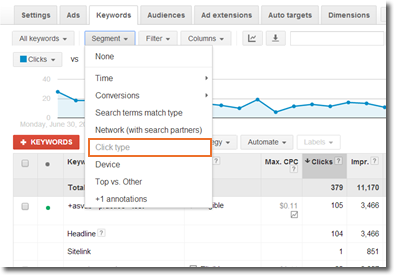 To access the Search Terms report in Adwords, simply choose the Keyword Tab for the ad group you are interested in, and select the Details drop down and the “All” search terms. Google Keyword Tool – Google Adwords’ Keyword Planner Tool (accessed from the Adwords’ Tools dropdown menu) also gives you the opportunity to find and add negative keywords by suggesting related search terms. 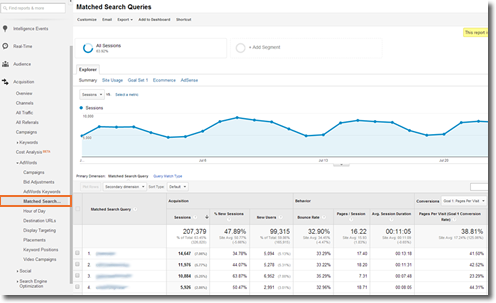 Google Analytics – Using the Matched Search Queries report in Google Analytics is one of the most powerful ways to identify negative keywords. With this report you can use many of Analytics’ native metrics (e.g., conversions, pageviews, Adsense etc.) to see which keywords are not performing well. Google Search – try searching for one or more of your keywords in Google. Pay attention to Google’s suggested search as well as the top results. For example, if you run a niche site on “Pet Doors”, you may want to add a negative keyword for “crossword” to keep out the crossword puzzlers looking for a word for “pet door opener” as shown below. the number of impressions you’ve received divided by the estimated number of impressions you were eligible to receive. Search Impression Share – the percent of impressions you received on the Search network out of the estimated total number of impressions you were eligible to share. Search Lost IS (budget) – the percent of impressions that you lost on the search network due to insufficient budget. Search Exact match IS – your impression share for exact matches on your keywords. Display impression share – your impression share for the display network. Display Lost IS (budget) – your lost impressions from budget on the display network. Display Lost IS (rank) – your lost impressions due to poor rank on the display network. I have found that Impression Share is a great diagnostic metric to help you understand changes (e.g., spikes in your traffic) in your Adwords performance. Oftentimes monitoring your Impression Share can help you identify competitive threats from new competitors or existing competitors amping up their Adwords presence. Ultimately, tracking impression share will help identify budget or bid related issues. Adjust your budget – if your Search Lost IS (budget) score is high (greater than 50%) than you should consider increasing your budget. If your campaigns have a positive ROI this should be a no brainer. Adjust your bids – If your Search Lost IS (rank) is higher than 35% you should consider raising your bid. This is a more complicated decision because it could impact your ROI for that campaign. Use the bid simulator to understand the differences in traffic you will receive for different bids. Improve your Quality Score – this is a much longer conversation…but any changes that you make in your Quality Score will result in your ads being shown more frequently and at a lower CPC. To increase your Quality Score you will need to optimize your landing page and ads for your targeted keywords. You should also prune your low Quality Score keywords. Sitelink extensions allow you to place additional links to different landing pages on your website below your standard ad text. Your click-through rate (CTR) will increase an average of 10-20%. It took me a while to understand how to report on Sitelink performance…so I thought I’d share it with you. I find it most useful to pick a single ad group and view how many times the sitelinks were displayed and clicked on by keyword. To do this, select your Keyword Tab for your desired Ad group. Then select the segment drop down and choose Click Type. You will then be presented with how many clicks, impression etc. occur for your headline ad compared to your sitelinks. In my case, most of my sitelinks do not generate many clicks…which is great for me… since I mainly use them to drive up my CTR for my headline ads. I’m continually surprised by how many PPC marketers that don’t know how to use Google’s Broad Match Modifiers correctly. Google added the broad match modifier match type as a hybrid between a broad match and a phrase match. To create a BMM match type you simply add a”+” symbol in front of your keyword (e.g., +keyword). A BMM keyword will only trigger ads for searches that contain the modified term (or close variations such as plurals) in any order. Google’s different match types allow you to balance the reach and relevance of your ads. Going broad gives you the most reach but the least relevance. Going exact gives you the least reach but the most relevance. BMM allows you to optimize the reach and relevance. Better targeted traffic – In general, the correct use of broad match modifiers should increase the relevancy of your traffic – resulting in improved CTRs and conversions. Less reliance on negative keywords – if you choose your BMM keywords correctly you will not have to be as diligent in using negative keywords. BMM keywords don’t show searches for synonyms and related searches which is where most of your negative keywords come into play. Flexibility on targeting – Placing only one modifier in a string of keywords will allow you flexibility in how you want to target your ads. For example, you may could consider the following keywords: pet +doors and +pet +doors for your pet doors niche. The first would include the search for pet doors and dog doors but not pet patio panels. The second term would show for pet doors but not dog doors. Be careful that you don’t restrict your searches too much…you may risk lowering your relevant traffic too much by exclusively using BMM versus broad matching. Did I mess up anything with all of my recent changes? Why did my clicks suddenly drop? Why are my costs skyrocketing? Where is all of my growth coming from? Before I learned about the Top Movers report, I spent way too much time pulling reports, downloading to Excel and pouring through tabs and tabs worth of data. The purpose of the Top Movers report is to identify which ad groups and campaigns have realized the largest changes in costs, clicks and conversions. The Top Mover report will also attempt to identify potential causes for the changes. You can choose different time periods to compare (i.e., 7, 14, or 28 day periods) within the last 90 days. I recommend that you take a look at the report on a weekly basis or any time you notice an unexplained change in traffic or cost. The Top Movers report starts with a summary table that highlights the total increases and decreases in costs, clicks and conversions. In the summary report, you should take a look at the Top Increases and make sure that these are “good” increases (meaning that you welcomed the increased traffic). If these are indeed welcome increases, you should determine whether there is an opportunity to gain even more traffic from these campaigns. Likewise, you should evaluate the top decreases and determine if there is a problem. Perhaps you need to take a deeper look at the Impression Share to determine if there is a new competitive threat. Below the summary report will be a more in depth set of tables that provide more details on the top increases and decreases for any of the analysis categories (cost, clicks, or conversions). Changes in Impressions, Clicks, CTR, Average Position, and Average CPC. In addition, the details section may provide some “Possible” causes from Google’s analysis of your recent account changes. Google’s “Possible” changes only highlights Account changes, not competitive or traffic changes. 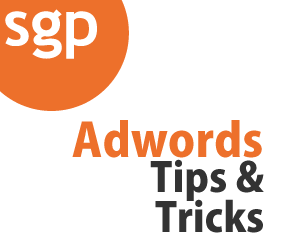 As I mentioned above, I plan on adding more Adwords Tips to this post as I come across them. Do you have any tips to share? If so, let me know in the comments. Subscribe to receive exclusive content via email and I'll send you a copy of my 40+ page eBook on how to start, grow (and profit!) from your online business. Do you use both BMM and broad match? Yes. Typically I use broad match early in my campaigns to identify good keywords. 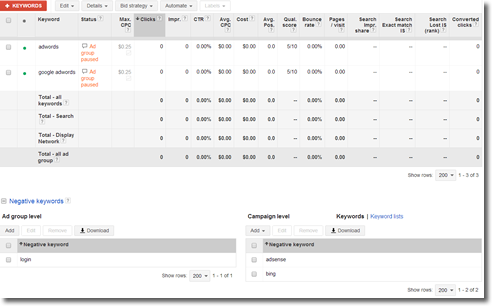 I then move those keywords into either an exact or a bmm adgroup (and remove from the broad campaign). As the campaign progresses I end up having many more bmm and exact keywords and I eliminate the broad keywords. Hope that makes sense!